Whilst I’m growing into my “wings”, English Piecing Papers and Pre Cut Hexagon Fabric Packs remain readily available and can be posted to you by contacting me on 0412 306 292 or emailing thequiltfairy@iinet.net.au. Have a look at “Come & See Us” for a full calendar of dates for 2016 where to find out Pop-Up Shop. Supplier of Die cut English Piecing Papers and Precision cut fabric pieces for patwork. Small projects that come with pre-cut fabric pieces, matching piecing papers. 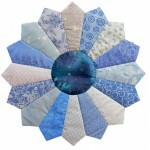 Stitch the finished paper pieced panel onto a backing fabric of your choice. To order state the preferred colourway.